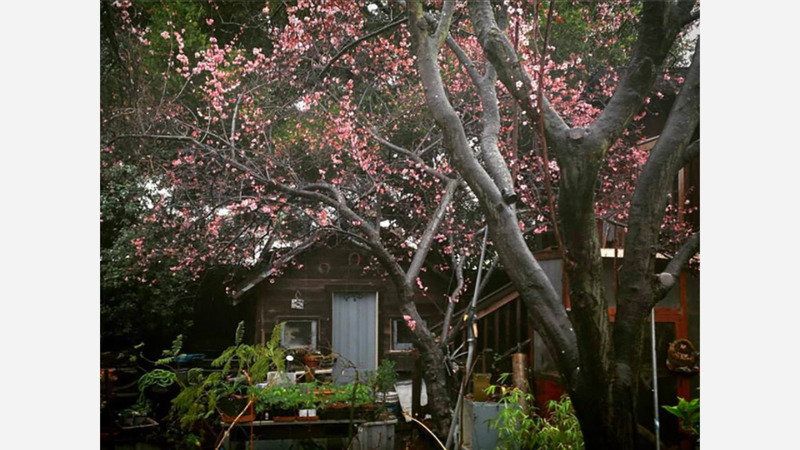 Canticle Farm is just off Foothill Boulevard in Fruitvale, but founder Anne Symens-Bucher says the community is located "at the intersection of faith-based, social justice-based, and Earth-based nonviolent activism." The urban farm promotes food sovereignty and security for 26 members spread over six houses, in addition to offering workshops and retreats for educators and the public. "Growing food is a way to bring community and connection in a neighborhood where people have fences and dogs to protect them," said Symens-Bucher via email. "Our vision is that our real security comes from relationships." A fourth-generation Fruitvale resident, Symens-Bucher conceived of Canticle in 1982, though its current form as an intergenerational, intercultural, interfaith community did not begin until 2010, she said. 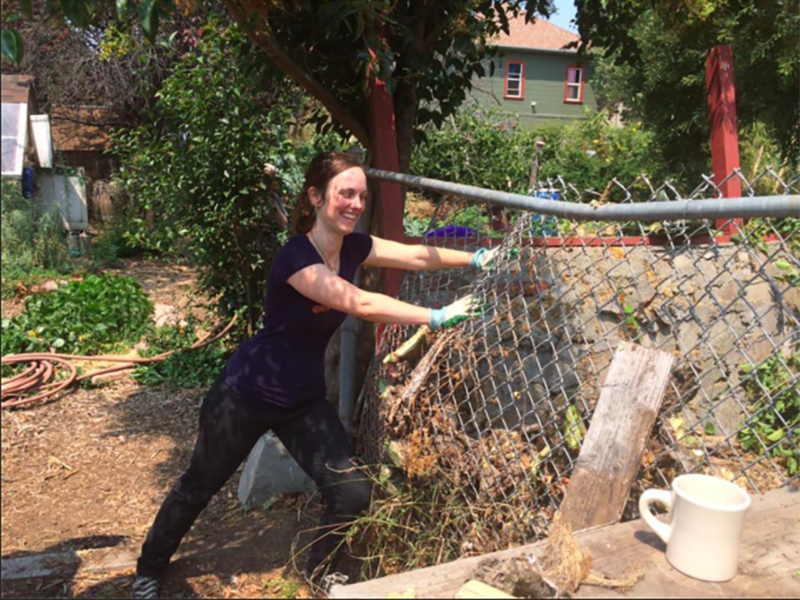 Chiara Symens-Bucher takes down a fence. The urban farm hosts community dinners every Tuesday at 6:30pm, along with a Sunday morning liturgy at 9am, followed by an open garden party. Following the tradition of loaves and fishes', attendees need not bring anything besides themselves, but are encouraged toRSVP via email. Canticle also hosts Spanish language natural-medicine making workshops, meals for neighborhood women and children, and hosts an ongoing support group for single mothers of color. In June, the farm will host a queer emerging artists residency, and later in the summer, it will host the California Allegory Youth Fellowship, a program for young climate change activists. The farm takes its name from the Canticle of Creation, a song of praise penned by Saint Francis of Assisi, the patron saint of animals and ecology. Though based in no singular religion, as an interfaith organization, the farm asks that residents and volunteers be grounded in a spiritual practice. The farm welcomes volunteers who are interested in farm work, nutrition, medicine, and other means of community building. "At the end of his life when everything was unraveling, he chose to sing a song of gratitude, praise and interconnectedness with all of the natural world," said Symens-Bucher. "As ecosystems, political systems, social and other systems are unraveling in our own time, we choose to put our attention on gratitude and sing a song of interconnectedness and thanks." "There is only one Canticle Farm," wrote Symens-Bucher, "but we hope that other people can be inspired to take down fences, grow food together and live in community across differences." To date, Canticle alumni have founded three projects: volunteer food redistribution service Fruta Gift, edible landscaping company Growing Together, and Amor Art Farm Oasis, which offers free weekly vegan meals. Canticle Farm is located at 1972 36th Ave. and is currently seeking volunteers with carpentry experience. General inquiries can be sent to canticlefarmers@gmail.com.